This is the first time I am spending Christmas in Germany, with my husband’s family, would love to see some traditional German celebration during Christmas or New Year. We arrived this morning, it is still a working day here in Germany, but my in-laws finished work early, and my mother-in-law was making Rouladen for dinner. 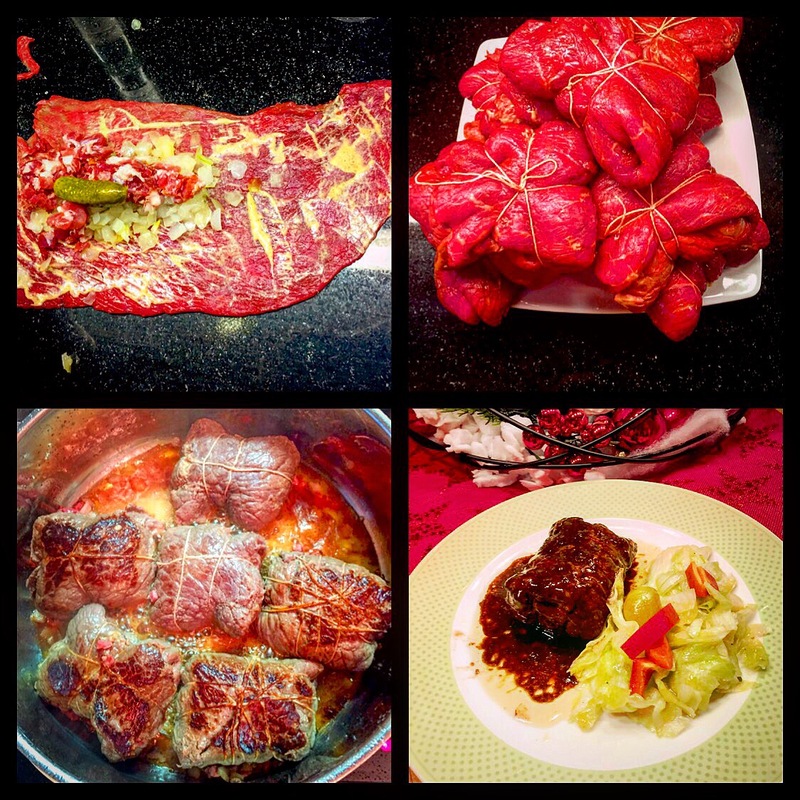 Of course I would love to learn the authentic German way of making Rouladen, especially the recipe from the mother. As I mentioned in my blog about how to make Rouladen, you need certain part of beef but that was a bit difficult to get in Hong Kong. Of course here in Germany will not be a problem. The difference of what mutter is doing, she is using finely chopped onion and bacon instead of what I was using are onion slice and the whole piece of bacon. I was using pickled cucumber but mutter was using the whole piece of pickled gherkin. Then, wrap the beef and tie it up with cotton. My husband was telling me, the sauce that his mother was doing for the Rouladen is super, so that is the most important part that I have to learn. First of all, heat up the saucepan with lard, and then fry the Rouladen and add some chopped onion and bacon in-between. Fry the Rouladen until both side turn brown, add some hot water when it starts to dry up, in order to keep a good amount of sauce. Cover with lid and let it simmer for one hour, keep adding hot water in-between when the sauce starts to dry up. The sauce mutter made is so much more simple than the one I learned on youtube, for sure I am going to try next time back home. I guess the lard does make a difference for the taste. When it’s done, remove the Rouladen from the pan. Use the sieve to get the chopped onion and bacon out from the sauce, and then blend it with the blender until it’s smooth enough to go through the sieve. Add flour to thicken the sauce if it’s too thin. Place all the Rouladen back in the pan with the sauce when the sauce is ready, usually this is served with Kartoffeklöße and red cabbage, but we were having that with salad last night.